OK - I'm ready to start creating a comprehensive and complete link building program for my site. I know I need to submit some articles that link back to my site, and perhaps explore the spinning technique you describe on the site, etc. I've seen several recommendations on your site ranging from free to paid article, directory and link building services. I want to move quickly and happy to pay for the right service if I need to go that route. I do have a few articles written on eZine Articles which get really good (50-80%) click through rates. I think it's time to write more articles and get them published along with other strategies. So what's the fastest (not cheapest) way for me to create a comprehensive program to build some great juicy backlinks to my site? I just wanted to chime in that when posting to forums be sure to create a profile so you can add an active link in the signature section to your website. This is true for article directories too. Along with including a link in your article be sure to take advantage of creating a profile so you can link back to your site. Try to use anchor text in your links for better SEO as well as to link to different pages on your website that you want to promote. Creating a comprehensive and complete link building program is not only a smart strategy but very necessary for anyone building an ebusiness. Backlinks makes the website world go round! For most of the link building I used SBI Link Building Services. The SBI Services also included submitting the site to several highly ranked free directories research as well as included recommendations for a handful of paid directories that I could submit to that would be the most beneficial for my sites. Another excellent way to build a lot of backlinks in a natural way is to send out a press release every few months. I use PRWeb which is rather pricey ($299 for the release that allows live links) but since your press release is sent out on all the major news wires, blog directories, and so forth you can pick-up a ton of backlinks that way. If you wait until Thanksgiving time(ish) PRWeb usually run a 2 for 1 special that I try to jump on. That way you get two press releases for the price of one! Then of course there are all the social media sites like FaceBook and Twitter. I actually cheated and paid my niece to set-up both for me since I just didn't want to learn one more thing like that right now. Now I have my SBI blog feed automatically post to each so I don't have to update them, it does it automatically. When you develop comprehensive and complete link building plan then everything you do over time, a little at a time, will gradually create a plethora of nice juicy backlinks which will improve your website ranking with the search engines along with getting you a nice steady increase in traffic. 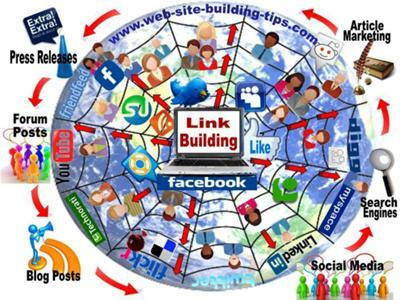 So be sure to include all the traditional link building strategies as well like article marketing, submissions to niche related directory sites, YouTube, sharing unique photos on Flickr, creating a variety of accounts with social media sites, and any other sort of publicity that gathers public interest in your ebusiness.